The pair of GBP/USD . The pair fell yesterday and is now trading at 1.5340 support. Possible continuation of falling of pair to the support level 1.5300. Further reduction is still limited by the strong support. If the support hold out, then maybe the price increase to the level of 1.5380. The pair of GBPUSD in 4H chart . the pair continues downward movement for Friday did a good third wave down to support at 1.5343, but corrective fourth wave up to the level of 1.5419 is not recognized as an indicator of correction may go down even by the third wave. GBPUSD chart 4H chart continues correction to the downward trend. for the last.The day ended with a fifth wave down to support at 1.5332 from 4 to 5 on a pink marking indicator waves, there was formed and 2 green indicator markings and went up the third wave of 2 to 3 on markup indicator until reached only to the level of 1.5474, further forward to the continuation and completion of the third wave up. Corrective pullback away from Europe morning highs of $1.5539 extends to $1.5485 as rate tracks euro-dollar slippage and the cross holds off earlier posted lows of stg0.73145. Next support in cable seen into the broken resistance level at $1.5480, now support. Traders have reported Middle Eastern interest provided the main supply headwinds earlier today above $1.5520, with sell interest reported back in place between $1.5525/40. Last edited by cybercode; 03-11-2015 at 06:17 AM. The pair of GBP/USD approached the resistance level 1.5555. If this resistance hold out, then can roll back the pair to the support level 1.5500. And then the new growth to overcome the resistance level. 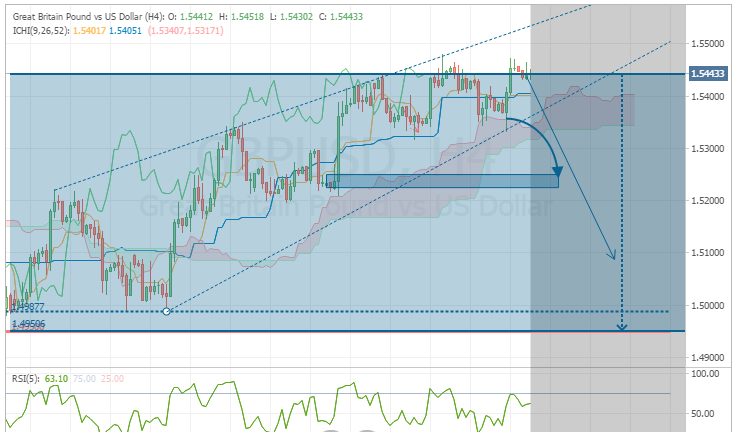 If the support can not stand, then perhaps fall to 1.5465. GBPUSD HIT THE TARGET AND RETURNED TO RECENT LOWS. In my previous analysis in GBPUSD from February 6th I took a view that with such a show of strength as we had seen in the market the only logical conclusion was to look for buying opportunities until there was price action based evidence to the contrary. Retracements to support levels should be monitored for momentum reversal signals. I pointed to 1.5487 to 1.5541 as a target area for successful swing entries. The pair overshoot the area by 11 pips before it turned lower again and formed a weekly shooting star candle providing the price action based evidence to switch the bias from long to short. It has now reached levels that are a potential buy level. After Friday’s upsurge in the US Dollar index (caused by a surprisingly positive NFP reading) GBPUSD price has moved down to levels where it started its up move in the beginning of February. This area coincides with the lower weekly Bollinger Bands and higher end of the downward regression channel. RSI (7) is diverging suggesting bullishness at current levels. This combination of technical factors has caused a move higher today confirming that buyers are still interested to bet for Sterling at these levels. This price action looks very much like a bottoming process and the fact it takes place in weekly time frame adds to its significance. With relatively strong economic output and well developing job market the UK is at the moment one of the strongest economies globally and we could see a rate hike in the latter half of this year. This is reflected in the GBPUSD. We will have more comments on the UK economy tomorrow as Bank of England’s Governor Mark Carney will speak at 14:35 GMT. In the daily chart GBPUSD moved deep below the lower Bollinger Bands suggesting the price was very much oversold on Friday evening. The Stochastics and RSI confirmed the idea and are now beginning to point higher. In the daily time frame this market is now ranging sideways and we should therefore look for trading opportunities at the edges of the range. The lower end of the range obviously is where we look for buy opportunities while the upper end of the range at or close to the February high can work as an area for short term long trade exits or short entries (should the price action so indicate). The 1.5036 is a high for a pivot candle at the bottom of the range and therefore points to the region of potential support. This level has already supported price in the beginning of February and seems to attract buyers now as well. The previous support at 1.5220 is now likely a resistance area. Four hour chart shows how Friday’s move lower was an overshoot as price extended from the trend defined by the regression channel. Now price has reacted higher from 1.5036 support and retraced back to the channel bottom where it is showing signs of weakness. The 0.382 Fibonacci level coincides with the 1.5220 resistance while the 0.618 level is at same levels with a former minor support (now potentially a resistance) and the upper Bollinger Bands. Even though the DXY is moving into new highs GBPUSD is still above the January lows after it moved above more than 12% from the January lows to February highs. Weekly chart is telling to longer term position traders that this market is possibly in a bottoming process as the price has moved out of the downward sloping trend channel, moved past four weekly highs and is now finding support just above the recent support area. Such an increase in volatility is usually a sign of a trend change. Shorter term traders could benefit from the longer term price action by trading the swings between the range edges using the support and resistance levels provided above. GBPUSD next immediate support could be at 1.4857, 1.4809 levels. Upside immediate resistance above at 1.4980, 1.5000 and 1.5008 levels. The uptrend may be expected to continue while pair is trading above support level 1.5575, which will be followed by reaching resistance level 1.5730 - 1.5790. An downtrend will start as soon, as the pair drops below support level 1.5575, which will be followed by moving down to support level 1.5425.